Sean got to exhibit Anodyne to kids at ChiTAGFair this past weekend, and will also be at MAGFest this January. And mobile gui update! First, I (Sean) was able to go to Chicago Toy and Game Fair this weekend to exhibit Anodyne. It was quite exciting indeed! Here's a video of some kids playing it! The reception was mostly positive, with kids from 8-13+ enjoying it. 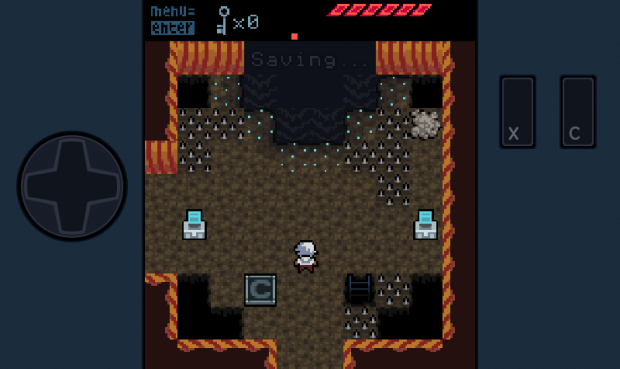 This is nice, as I think anyone interested in an adventure game will be able to play and enjoy Anodyne! Lots of kids had to have their parents pull them away from the game, a sentiment I can relate to very much. Also exciting is that yesterday night I learned that Anodyne was accepted to be shown at MAGFest's Indie Game Showcase, the first showcase ever! So I'll be over in Maryland showing the game for parts of the day on Jan 3-6. Come on by and say hi if you'll be there. It should be a good time! I'm excited to meet other game/game music/game devs! Well, otherwise, we did not do too much work on the game. I fixed a few design issues and bugs, worked a bit on a boss, and wrote a little music, but as soon as I finish this essay in an hour, I'll be working on the game a lot! So I'll be able to tie up some loose ends. Some slightly less exciting news: We're pushing the game release to early January. Jon and I agreed that it would be a better idea if we spend some time polishing up the game before release. I think this is a good idea. That's it. Follow me on Twitter, and vote for us on Greenlight, as always!